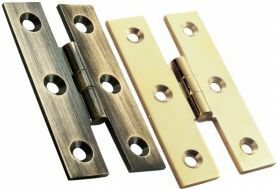 Brass H pattern cabinet hinges, supplied in pairs with screws. Size 63mm x 38mm x 2.5mm. Available in Polished Brass & Antique Brass.